As large banks pile into microfinance, will profits get ahead of people? 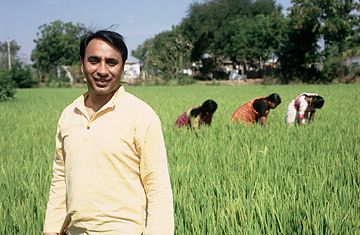 SKS head Vikram Akula, in a rice field his firm helped to fund. Rafael Llosa's company has been lending money to some of the poorest people in Peru for 30 years. It used to be a fairly lonely endeavor. Giving tiny loans to impoverished women to make ceramics or to farmers to buy milk cows was hardly seen as a great business.